When I find myself elbow deep in a particularly complex art project or on a long drive I inevitably seem to run out of podcasts to listen to. (My eardrums devour them like a pack of ravenous rabbits would a single stalk of celery). When I discover that has happened I branch out mildly into the realm of audiobooks. I’ve listened to a few so far that I wanted to share with you, so this is the first of several audiobook reviews I’ll be bringing to you. It’s a bit hazardous to try to read while I’m driving, and I have several 14+ hour road trips planned for my summer. So, It’ll be a good time to give some longer books a thorough listen. Today, let’s talk about what the world might look like after some unknown event caused a fragmentation of the civilizations and countries of the world. 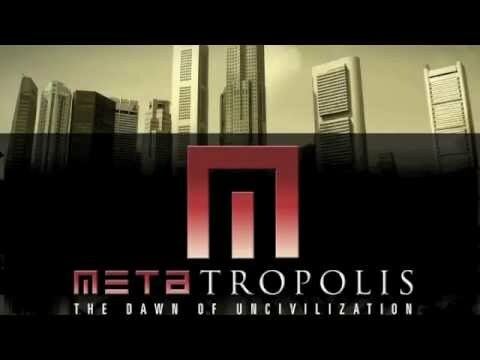 That is Metatropolis- The Dawn of Uncivilization. Metatropolis is a Sci-Fi anthology of stories that build off of the same world but tell the stories of it’s various corners with a collection of incredible sci-fi writers. This book was edited and written in part by John Scalzi, with the writing of Elizabeth Bear, Tobias S. Bucknell, Karl Schroeder, and Jay Lake. The way they collaborated on writing the story was a really refreshing thing to see. Normally, writers are given a theme and some guidelines and given free rein, but in this collection each story informed the next and built off of it. It was like a massive game of the “and then…” campfire game. Side note: For those of you who weren’t lucky enough to spend your summers huddled around a fire in the woods being eaten alive by bugs the “and then…” campfire game is where one person starts a story and when it gets to s pivotal moment in the action they say “and then…” which is where the person next to them pops in and changes the story’s course. My childhood friends and I have constructed some truly spectacular tales of daring, adventure, and absurdity using this method of boredom busting. And, for once, that synopsis actually felt pretty good, so I’ll leave it there. This story was addictively engaging. I would find myself so wrapped up in the story that I would make up more work for myself at night so I could continue listening to the story. Or *gasp! * actually sit still for ten minutes while listening to the end of the segment. I really loved the worlds and characters that were built in this. Each one was so well crafted that I often find my mind drifting back into those places and thinking about what my neighborhood would look and act like if the structure I am so dependent on would dissolve. And that’s the coolest part. Each writer looked at an entirely different part of the world which made each segment feel so unique. There was the lethargic and passive existence of the people of Detroit Michigan, the half virtual reality where countries and borders were as fliud as trending twitter hastags, and more. I really enjoyed every segment of this book and felt like they were well balanced so no one segment really out-shown the others. Although I really enjoyed the one where a pig named Lunch played a big role in it. Pigs are awesome. I recommend listening to the audio version of this over reading the written form. Each segment had a different narrotor and the voice talent in this book was so perfectly paired to each story. They had Battlestar Galatica’s Micheal Hogan, Alessandro Juliani, and Kandyse McClure; as well as the audiobook narrorators Scott Brick (known for Dune) and Stephan Rudnicki (known for Ender’s Game). And these stellar performers wove their voices into such an entrancing audio sci-fi delight that I think anyone would genuinely love listening to this book. I’m giving Metatropolis: The Dawn of Uncivilization a 5 out of 5 blood spattered star rating. It is a great way to spend 9 hours and 13 minutes. Your imagination and commute will thank you.